I like technology. It is in every part of my life, and I like it lots. If the electrical grid was ever to go down I'd be done for. Don't rely on me to bring the human race to the next level unless it has a place to plug in. To me, technology advancements are like a never ending Parade of Tomorrow. I enjoy seeing how developers fit new advancements into vehicles to make them safer, and into our smart phones to make them more tools, than toys. Yesterday, I was able to try out a new tool for the first time, and simultaneously use the new Cumberland Farms in Fiskdale on opening day. 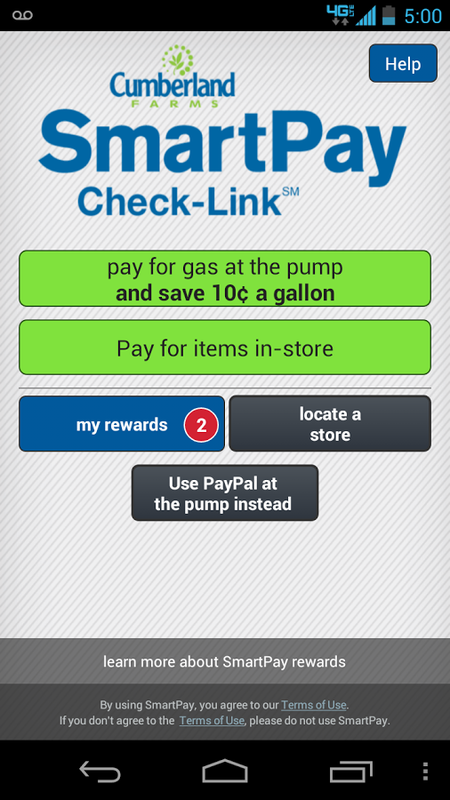 A few weeks ago I downloaded the Cumberland Farms smart phone app "SmartPay". The app is very clever. When I pulled up to the gas pump, I pulled out my phone, touched the buy gas option, entered my PIN number. The app displayed the Cumberland Farms location I was at, and asked me to confirm the location, and enter the pump number. Once done, the pump clears, I chose the grade of gas, and pumped it into my car. Not only I was I able to pump gas by using the privacy of my phone, I also saved $.10 per gallon of gas from the posted price. Cumberland's doesn't have to pay any credit or debit card fees to the banks since the app is tied directly to my checking account like a check would be. I also earn rewards! Yesterday I had a FREE coke posted on the app that was mine to claim until May 2. The smart phone app can also be used inside the store for other purchases. Yes, I could have saved a bit more at the gas station across from Shaw's. I use them as well, and I use the Stop & Shop gas, as well. The rewards I get from Stop & Shop don't last more than one time at the pump, and then I have to go earn some more, by buying more at their store. They also expire after 30 days, too. Sturbridge Gas has a consistently low price, as does Pilot out on old Route 15, but convenience is worth a good amount as well. Cumberland Farms is only 0.8 miles away. The gas price may not get as low as Sturbridge Gas, but at times the convenience certainly makes up for it. Gas was posted at $3.55 at Cumberland Farms yesterday, and I paid $3.45 with my discount. I know, I could have saved a bit more by traveling down to Pilot, as I sometimes do, but Pilot is 6 miles away from our house, and they don't have a neat app to use at the pump. Sometimes it all about the toy, and not so much the tool. Are you using Android or iOS, Wally? I sent that last one too soon. I wanted to add that I "drive a little to save a lot". I often go down the Petro Max in Southbridge by the Big Bunny market. The price per gallon can't be beat, and they still give the cash price when using the debit card. I refuse to fuel up at Sturbridge Gas since they stopped giving the debit card "same as cash" discount. The Cumby SmartPay might be just the thing to make the choice to stay local. I use IOS. It's available for Android, too. Since I go to the recycling center I'll just keep filling up at Pilot, saving another few cents over Cumby it appears, plus gaining rewards and a gas discount with my credit card. I'm up and running with SmartPay. It was a very simple process to get set up. I stopped by and got two free SnartPay cards as my wife doesn't have a smart phone. SmartPay issues you a third account number to use with a smart phone, so I can either use the phone or my card. I've tried both methods, and to be honest while the phone method is very slick, I think the card is much simpler; just scan the bar code on the card, and enter the PIN. While this payment method may work for some, I can see others balking at supplying their banks' routing and checking account information. The nice thin is SmartPay is the same as writing a check. No credit card. No debit card. The account number and routing number for ones account is in full view at the bottom of each check one writes. Shouldn't be a problem, just a little education will convince more of a safer way to pay.